It's still all go......257 Squadron's boiler has passed its hydraulic and steam tests, it's back at Herston and mounted on the frames with its ash-pan and smokebox.....80104 is back at Swanage but not in service.....Eddystone is at Tyseley for bottom-end overhaul and work on Sidmouth continues. 34072 passed its steam test on Friday 14th October. 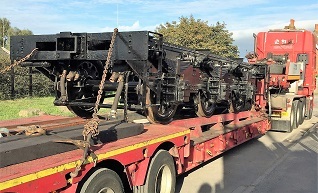 It arrived in Swanage on Thursday 20th and was lifted on to the frames with the new ash-pan and new smokebox. The race to complete the loco begins; the target is to have it in service for the start of the 2017 operating season at Swanage. The boiler passed its hydraulic test (one hour at 325 psi) on 7th October and a fire was lit to slowly warm it over the weekend. As steam was raised a few minor glitches were identified and fixed, so that by the following Friday it would sit at 250 psi securely. 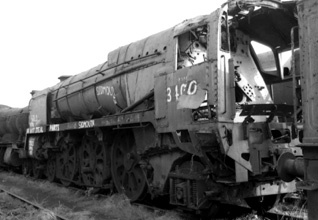 34072 257 Squadron's chassis was pulled out of the works into the yard on temporary track. 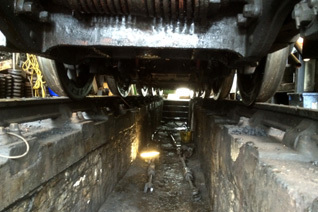 An 80 ton crane lifted the boiler from the truck which had brought it from Teesside. Then it's mated with the new ash-pan by aligning the studs on the bottom of the firebox with the holes in the flange of the ash-pan. Ash-pans and fireboxes are like pandas.....reluctant to mate. Ron Neal provides encouragement with a gas axe. 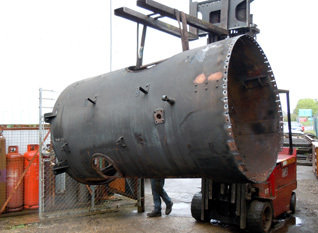 When the boiler and ash-pan were as one they were lifted on to the frames. The new smoke-box was lifted into place and the loco, now 20 tons heavier, was hauled back into the works with the aid of two fork-lifts, a block and tackle, and stout men with pinch-bars. As previously reported the frames remain on a well-wagon north of Norden, the boiler is at Bridgnorth and two wheelsets have gone to Buckfastleigh for new tyres. Meanwhile there's a lot of work focussed on finding, overhauling or making components. Some parts have been purchased from other Bulleid owners, and we were very kindly given two motion parts. These had apparently been gracing someone's home since the 1960's when they had been liberated from Cashmore's. 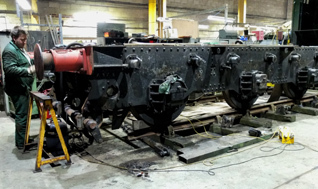 Sidmouth's front bogie has been stripped and is being overhauled. We need the front and rear trucks available when the frames come into works in 2017 so they are movable within the workshop. 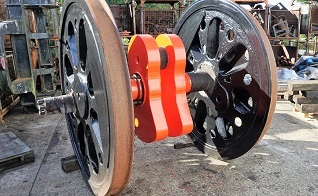 Sidmouth's leading and trailing driving wheels have been sent to SDR Engineering at Buckfastleigh to be re-tyred. 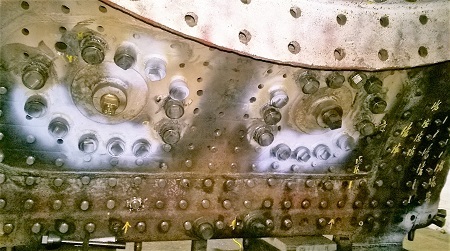 The centre set do not need re-tyring, and have been painted. The eccentric which drives Sidmouth's middle motion is being overhauled. Sidmouth needs new front buffers. 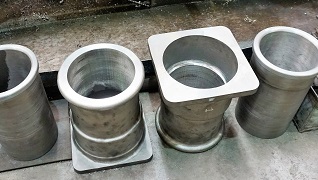 The casting were made and have been machined. With only three of our seven locos currently earning their keep we're more than usually reliant on our supporters to help us help fund work on the locos. There are several of way in which you can do this, and they are described here. 80104 returned from Tyseley on 14th September and unloaded at Norden. It was hauled down to Swanage and left in the goods shed siding. 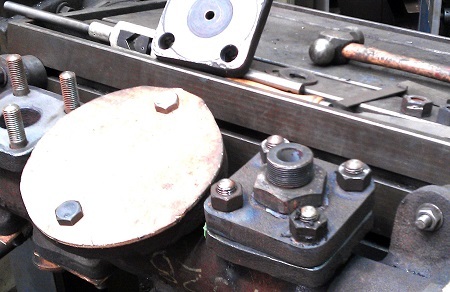 On Friday 16th September SLL volunteers reassembled the brake linkage, sanders and fitted new brake shoes. 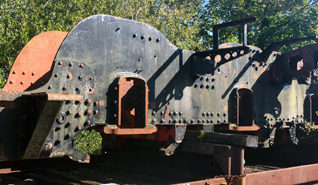 It was known that the cylinders would need to be re-bored and new liners fitted. We'd hoped that this could be done over the winter, allowing 80104 to re-enter service for a couple of months, however inspection showed that the relining must be done first. 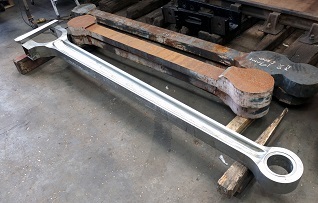 The liners are on order and Bryn Engineering have started work re-boring the cylinders so that a cast-iron liner can be fitted. Dave, Jim and Nick fitting new brake shoes to 80104. Ray is in the pit. There were six inches of rainwater in the pit when we started, so we had a 'team briefing' in the cabin while the pump did its stuff. 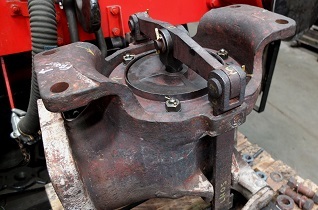 Bryn Engineering use a portable hydraulic-powered borer which attaches to the cylinder, using the studs for the cylinder cover. 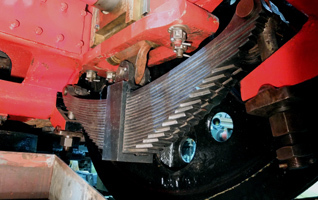 The rotating cutting tool rebores the inside surface of the cylinder. As the cast iron liner is 1/2" thick quite a lot of metal is removed. With its boiler at Buckfastleigh and frames at Tyseley there's not much of Eddystone to see in Herston works. The tender frames have been overhauled and moved off-site to make space, which has been taken by the tender of Swanage Railway's N class 2-6-0. SLL has agreed to overhaul the tender under contract to Swanage Railway; getting this job done naturally speeds the loco's completion and it will make space for us to have both Sidmouth and Eddystone in the works once 257 Squadron is completed. 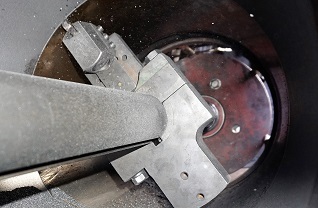 Before Eddystone left the works the hopper mechanisms were cut away from the ash-pan. The hopper doors can be re-used though the rest of the ash-pan is scrap. Eddystone's tender frames have been overhauled and moved off-site. A new tank is being fabricated on Teesside, and will be fitted in 2017/8. SLL is an amalgamation of single-loco groups, including Southern Pacific Rescue Group, which acquired 34028 Eddystone for the princely sum of £6000 in 1984. There's more about the scramble to raise that amount here. This advertisement appeared in Steam Railway magazine in August 1988. While the appeal to fund "Kent's Heaviest Locomotive" may sound rather odd today, it did the trick! This year we returned to the Severn Valley Railway for our shareholder Driving & Firing sessions and Annual General Meeting. SVR is home to two Bulleid Pacifics, Sir Keith Park and 34027 Taw Valley, and we were very privileged to be allowed to drive Taw Valley, courtesy of owner Phil Swallow. Unusually Sir Keith Park was facing north, initially for the benefit of the previous week's "Pacific Power" when two LNER Pacifics (space does not permit mention of their names) visited the line. 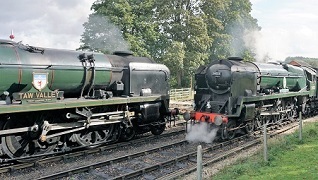 This made for some interesting photos when the two passed at Arley station twice per day. It was left facing that direction to facilitate loading on to the low loader during the following week for its visit to the Keighley & Worth Valley. 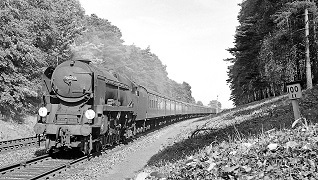 Sir Keith operated six round trips on 28 - 30th September, and Taw Valley ran four trips on 29 - 30th. 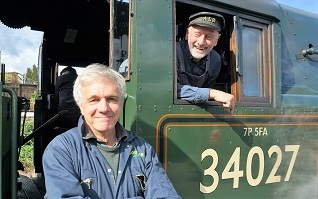 In all 40 shareholders enjoyed their footplate experiences in excellent weather, made even better by the skilled and friendly supervision of the SVR train and footplate crews. Taw Valley enters Arley station to pass awaiting Sir Keith Park. Many thanks to Phil Swallow for allowing our shareholders to drive his loco. SLL Chairman Simon Troy and volunteer Malcolm Garner take the customary pose at Kidderminster station after their run on Taw Valley. On the afternoon of 1st October our AGM was held at the Engine House at Highley. Procedings passed uneventfully, except for the passing whistles of two Bulleids. Following our AGM Sir Keith Park travelled by road to the Keighley & Worth Valley Railway for their Autumn Steam Spectacular. 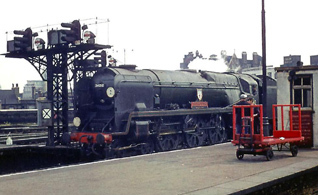 It was the centre of much attention, not least when leaving Keighley station on a stiff gradient and curve; the loco's sanders were reportedly malfuctioning. Jeff McKever captured its efforts on video here. Norman is back in service at Embsay where the Halloween and Santa Special season is fast approaching. Despite Google's best efforts to make our former Picasa galleries unmanageable, we're still adding a steady stream of photos to the 'Restoration 2016' gallery, and others from time to time. New photos of our locos in BR days are getting rarer, however Facebook has recently featured a series of photos taken by Nigel Kendall who lived in New Milton in the 1960's. Nigel very kindly offered us copies of his photos featuring our locos. By the 1960's most original Bulleids were working west of Salisbury, so Manston and 257 Squadron don't feature in his collection, but Sidmouth, Eddystone and Sir Keith Park do. Full size versions of his photos can be seen in the galleries of those locos, and Nigel has recently published a updated hard cover of his book 'Steam Leviathans', ISBN: 1494758415. Once again we're making a wall calendar featuring some of the best photos of our fleet, new and old. Each month has an A4 photo and an A4 calendar page. The price is £10 including UK postage and packing, the profits (if any) going to Sidmouth's restoration. If you'd like a copy please drop an email to nicksidmouth@gmail.com and we'll sort out payment and delivery. All orders must be received by 20th November, and the calendars will be delivered before Christmas. What better way to keep tabs on all those trips to the dentist, visiting relatives, and your loved-one's pilates classes than with an SLL 2017 calendar? Each month features one of our locos in action, and each page comes with a convenient hole for wall mounting. (Nail not included.) If only we had five more locos - then we could have a different loco every month! Work continues on four SLL locos; 80104 is at Tyseley for bottom end overhaul, Eddystone has been stripped and dispatched for work at SDR Engineering and Tyseley. 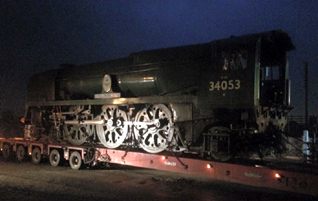 257 Squadron has had everything possible done to a loco without a boiler, and parts are being gathered for Sidmouth. With most of its cladding in place 257 Squadron looks almost complete, however there is still no boiler under that cladding! 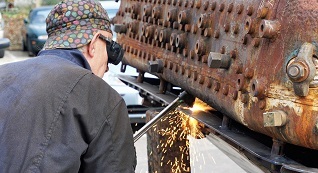 A small amount of work is required before the boiler faces hydraulic and steam tests. When the boiler finally arrives completion of this loco will be top priority to ensure it enters traffic in 2017. Since it arrived in Herston works in March 34028 Eddystone has been stripped of its fittings, cab, boiler cladding, smokebox, etc. 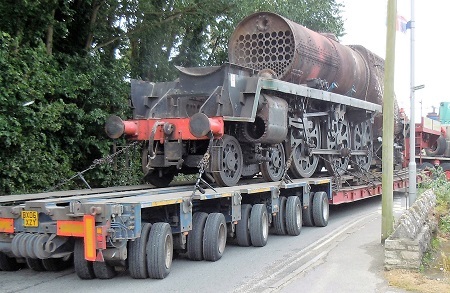 In a carefully planned maneouvre it was put on a low-loader on Wednesday 3rd August and moved to Buckfastleigh, albeit by a roundabout route - it was spotted heading east on the A31. On 4th August the boiler was lifted from the frames while still on the low-loader, which continued to Tyseley, arriving on Friday 5th. 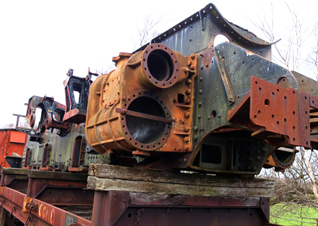 SDR Engineering will overhaul the boiler, and Tyseley will overhaul the bottom end, just as they are doing for 80104. The rolling chassis should be back at Herston early in 2017, while it will be at least a year before the boiler is ready. This gives us a fair chance of getting Eddystone back into service in 2018. 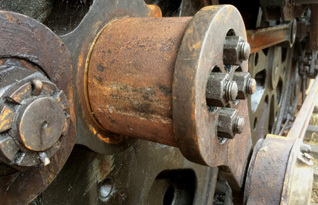 Sidmouth will need a new inside connecting rod, and two new sets of coupling rods. Work on the connecting rod started several years ago, and it's now complete. The coupling rods exist only as steel blanks which will need machining. Eddystone's regulator has been stripped, overhauled and re-assembled. It will go on the shelf ready for when it's needed in a year or two. Space in the workshop will be available for Sidmouth's frames when 257 Squadron is complete, so we're looking at early 2017 for that to happen. Meanwhile we're procuring missing components and repairing or remaking those we have. 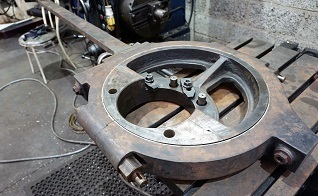 During July the front and rear driving wheels were sent to Buckfastleigh to be re-tyred and profiled by SDR Engineering. A fuller description of the project and progress so far can be found in the Sidmouth Restoration page. Financial support in the form of share purchases and sponsored item continues at a fair pace, though there's still a very long way to go. The firebox bricks, the new safety valves and quite a few tubes have found sponsors. Our promotional video has had over 2,700 views, and the webmaster is limbering up to give several talks to railway clubs and other groups in the autumn. At the 2016 Exeter Model Railway Exhibition Richard Harper showed his superb model of Sidmouth station circa 1959. While there was no re-run of 21C110's naming ceremony in 1946 there was a re-enactment of the only other recorded visit of a Bulleid Pacific to Sidmouth, namely 34104 Bere Alston's arrival on Sunday 3rd August, 1959 with an excursion from Plymouth. Two SLL shareholders were assisting with the display, and fliers promoting the restoration were distributed. More details of the layout can be seen here. 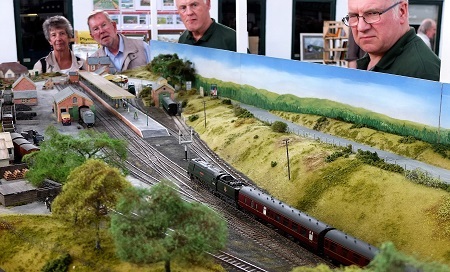 Richard Harper's model of Sidmouth station was much admired at the Exeter MRE. This photo features the arrival of 34104 Bere Alston with an excursion from Plymouth, as occured in 1959. 80104 arrived at Tyseley on 2nd June for bottom end overhaul, primarily all of its axle boxes. After stripping it was decided that the coupling rods needed new bushes and all the tyres needed to reprofiled on the wheel lathe. Naturally this adds to the cost and time of the job, though it clearly makes sense to do such work while the wheels are out of the frames. The cylinders also need to be bored and relined, however due to the delivery time for the liners this will be done at a later date. 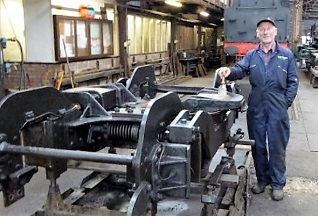 Volunteers at Swanage spent time stripping the brake and sanding gear off the loco while it was still on Swanage Railway, however the rear bogie needed cleaning at Tyseley. Malcolm Garner kindly stepped forward and completed the task, saving us time and money. 80104's arrival at Tyseley was just prior to one of their occasional Open Days. 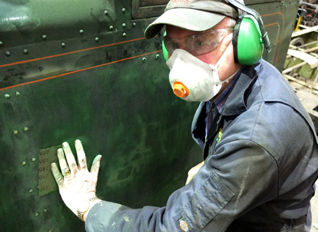 Colin Eyles was there to see the work in progress on 80104. 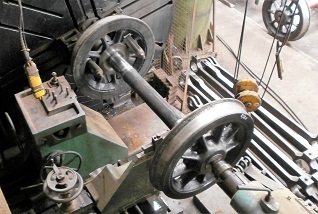 Here the pony truck wheels are on the lathe to be re-profiled. It wasn't possible to clean 80104's rear bogie prior to the loco's move to Tyseley. SLL Volunteer Malcolm Garner visited for the day and did the job on site. Manston has been in regular use at Swanage. Its boiler ticket runs to the end of 2017, which underlines the need to get 257 Squadron back into service and to crack on with Eddystone's overhaul. 34053 remains in regular service at SVR, and will be used for this year's upcoming shareholder Drive & Firing days, along with - courtesy of owner Phil Swallow - 34027 Taw Valley. Even with two locos we've not been able to accommodate all of our supporters requests to Drive & Fire this year, partly because we've tried to give priority to those who have recently joined us. Norman travelled to the Foxfield Railway in July for their steam gala. The Staffordshire line is noted for steep gradients and mineral wagons, just the work that Austerity saddle tanks were built for. The sight and sound of this was impressive, as can be seen on Alan Parr's video. In case you were wondering, Norman is now wearing NCB livery and numbered 35. Its name is painted below the 'C' on the saddle tank, and it's now back in service at Embsay. 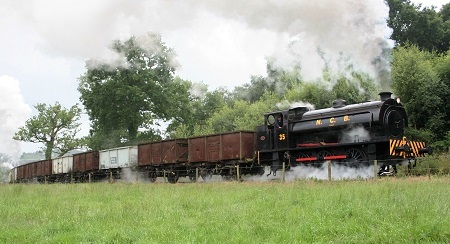 Norman (aka NCB No 35) blasts its way up the 1 in 19 gradient of Foxfield Railway hauling a string of mineral wagons. Well Google hasn't gone bust, and the photos are still there, but Picasa been replaced by Google Photos. The photos are still there (as are the captions, mercifully), but galleries are now displayed in a random order as you can see here. The Google Product User Forum is full of angry users demanding improvement, and hopefully it will get better, though quite who has benefitted from this change is not clear. The last image to sneak under the wire into Picasa was this shot of Eddystone's steam manifold after it had been overhauled and cleaned up for storage. Wooden covers were made to cover the flanges. Volunteer Neville Crook did the job and took the photo to record his handiwork. 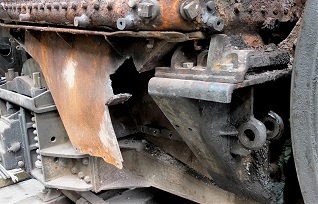 Reading through the above reports of the work on our locos you might surmise that the SLL Piggy Bank has been taking a beating, and you'd be right. Whether it's a shareholding, a donation or sponsoring a component for Sidmouth we would really like you to Support Us. 34072 257 Squadron's boiler is expected shortly, and we'll be going flat out to complete it and get it back into service. It's been clear for some time that 80104 will need major work on its axle boxes; we've bitten the bullet, it's been stripped and will be sent to Tyseley shortly for bottom end overhaul. Work on the restoration of 34010 Sidmouth is building up; components are being collected and bought, and plans are afoot to move its boiler from Bridgnorth to a boilersmith for major overhaul. Finally, after consultation with Swanage Railway we've agreed to fast-track the overhaul of 34028 Eddystone alongside the restoration of Sidmouth. 34028 Eddystone moved into Herston works on 23rd March. The plan was to remove its boiler for use with 34010 Sidmouth, however plans have moved on rapidly; Eddystone and Sidmouth will now be overhauled / restored in parallel and will use their own boilers. Work on 34072's boiler is approaching completion. 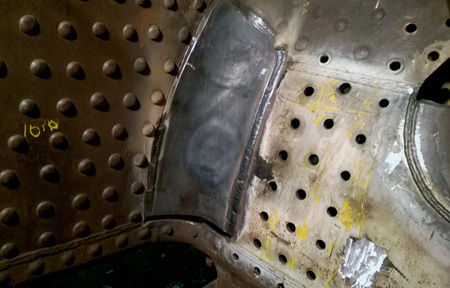 The welding of new sections into the inner firebox is completed. Stays around the top of the boiler must be made and fitted, followed by hydraulic and steam tests. With luck it wil be delivered to Herston in July. Just about all the jobs which can be done without a boiler in place have been completed, and we're hoping to out-shop the loco before the end of 2016. 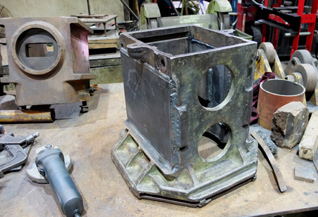 The saga of 34072's boiler repairs is coming to an end; the welding in the firebox is now complete, and stays around the crown now remain to be completed. 80104 came out of service on 7th May. 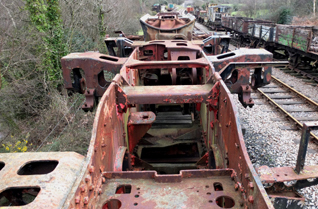 It was stripped at Swanage and will moved to Norden to be put on a low-loader, target date 1st June, thence to Tyseley for bottom end overhaul. The work will be fast-tracked, and it's hoped to have the loco back in service at Swanage before the end of the season. 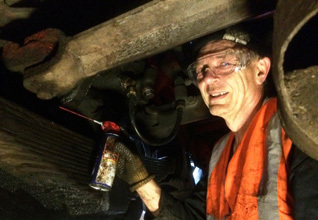 SLL volunteers Nick, Nick and Dave were drafted to Swanage loco shed and spent time in the pit stripping brake and sanding gear off 80104 prior to its dispatch. Nick Wren applies WD40 to the split pins securing the horn plate nuts. Work on the frames of SLL tender 001 is complete. We await the arrival of the new tender tank. This should be completed in 2016, allowing the tender to be removed from Herston, freeing up space to work on locos. This tender will be used with 34028 Eddystone, with which it ran previously. By the time Sidmouth is complete, 34070 Manston will be out of service (December 2017). Manston's tender (i.e. SLL 002) can run with Sidmouth, and - whisper it not - we might build a high-sided tender to run with Manston (and 257 Squadron). Eddystone's boiler will go back on to Eddystone so Sidmouth's boiler will be overhauled to run with Sidmouth. In the long run the costs to SLL remain the same, though the cost of overhauling Eddystone is brought forward by several years, and it adds work, time and cost to Sidmouth's restoration, with 2019 the earliest feasible completion. 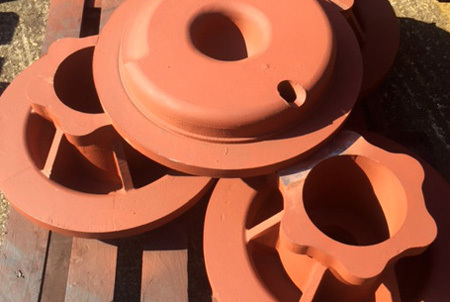 New cylinder covers have been cast for Sidmouth. These will join the long list of components to be machined. That said, there's already a whole range of work being done on Sidmouth. The frames will come into the works when 257 Squadron leaves, and we're keen to have the front bogie and rear truck overhauled by then, so that the frames can be rolled within the works if required. We'd been looking for ways to parallel process Sidmouth and Eddystone, and a viable plan has emerged. 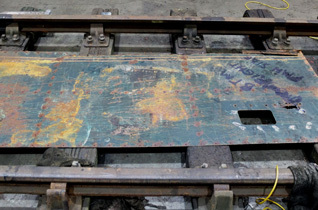 Eddystone is in Herston works where it's been stripped and many parts have been cleaned up and labelled. 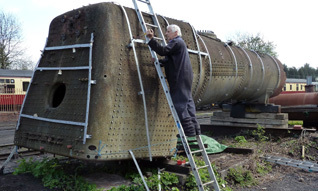 In a few weeks it will be moved to Buckfastleigh where the boiler will be lifted. 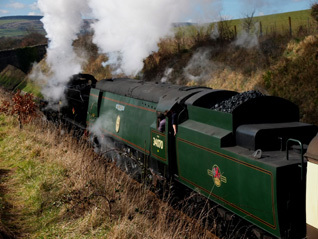 South Devon Railway Engineering will repair the boiler and return it to Swanage in 2017/18. The frames will go on to Tyseley for work on the bottom end (similar to 80104's). Outsourcing both the boiler and the bottom end frees up time and space for us to finish 257 Squadron. The cladding has been removed from Eddystone. Unlike 257 Squadron's casing, it is in good condition and can be reused. It's been cleaned, de-rusted and given a coat of primer where required, before it goes into storage for the next year or two. 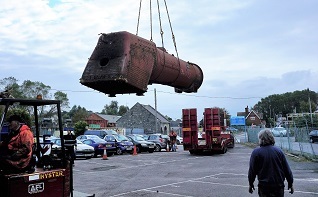 Eddystone's smokebox has been removed too; unusually it's in good condition and can be reused. Where's the money going to come from? We're glad you asked that question! Overall, the only additional item is the possible construction of a fifth tender. However outsourcing the bottom end of 80104 and 34028 increases expenditure, and the parallel overhaul of the boilers of 34010 and 34028 brings forward costs. We will lose several months of hire fees for 80104. On the brighter side, 80104 will re-enter traffic this year with five years remaining on its boiler ticket, and 34028 will enter service sooner than Sidmouth could have under our previous plan. Meanwhile we will need a steady flow of income from shareholders, sponsors and donors if we are to maintain this schedule. Please see how to support us here. Contrary to the received wisdom that we're all getting older and volunteers are fading away, we're pleased to say that we continue to find a steady stream of new recruits; our numbers are at least steady, and probably increasing. Their work makes up around 50% of the total manhours and reduce the cost of each project by maybe 25%. A fair number of our regulars come from London and the Midlands and pass near other heritage lines on their way to Herston, so we must be doing something right. We certainly welcome all of our volunteers, and try to use their time and skills well. Given the range of projects described above there will continue to be plenty of work for volunteers with all levels of skill. If you'd like to get involved why not drop into Herston and have a word with Willie Bath or Bob Bevis? There's more about volunteering here. 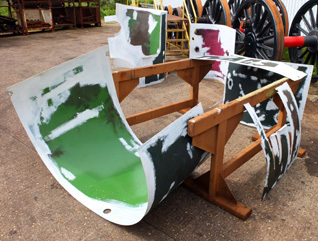 Sidmouth's restoration is ramping up with work on the tender and major components proceding well. The list of items to be repaired or re-made is extensive, likewise the cost, so we're asking people to help us by sponsoring one or more parts. There's something for most budgets, from 112 boiler tubes at £65 each to the centre connecting rod at £5,000, and many others in between. Please look at the Restoration Appeal page and scroll down to see the details of the sponsorship scheme and the list of items, or you can simply download the Sidmouth Sponsor Form. Sponsors contributing £250 or more will be eligible for a copy of Richard Green's Locos-in-Profile fine art print of Sidmouth, details of which are here. Restoring Sidmouth - now out on video! It's fair to say that our 700 shareholders include many capable people with experience and contacts within the world of heritage railways. Among them is Nick Dodson who runs Statesman Rail and RailFilms, and happens to live close to Sidmouth. When he heard that we were embarking on the restoration of 34010 Sidmouth he got in touch to offer his video-making skills to create a promotional video. Some of the source material came from our photo galleries, we found two rarely seen clips of Sidmouth running in the 1960's, while dialogue was shot 'on location' in Sidmouth and Herston. Our locos' tour of Britain has continued. 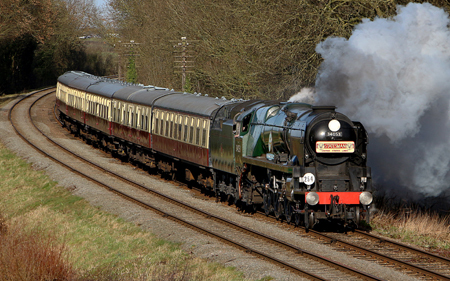 In March both 34053 Sir Keith Park and 34070 Manston visited the West Somerset Railway for their Spring Steam Gala. The event was to mark the 50th anniversary of the closure of the Somerset & Dorset, with a range of motive power to suit. Along with our locos there were two Fowler 7F 2-8-0's built for the S&D in 1914, Fowler 4F 0-6-0 number 44422, a Standard 4MT tank, an LMS 8F 2-8-0, and BR Standard 9F in 'Evening Star' green, but not a GWR loco in steam! Such a line-up was guaranteed to draw the crowds, and there were some spectacular sights, for example the above (courtesy of Nick Field) showing the 13:25 from Minehead at Castle Hill on Sunday 6th March hauled by Sir Keith Park and Manston. 34070 Manston leaves Washford station, piloted by S&D 7F 53808 on 10th March. 34098 Templecombe (the loco previously known as Sir Keith Park) waits to leave Minehead station on 11th March. For the second weekend 34053 was renumbered as 34098 and named Templecombe. This was sponsored by the Friends of Templecombe station. 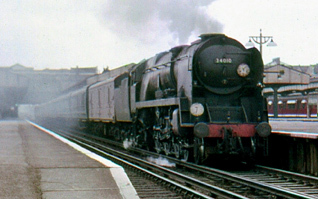 The real 34098 Templecombe was shedded at Bournemouth in 1958-9 and ran on the S&D as did Sir Keith Park and Eddystone. There are plans afoot for other Gala trips during 2016, not least Norman which may visit another line for a couple of weeks in the summer. More photos in the SLL on Tour 2016-17 Gallery. Work on 257's boiler is continuing, and hopefully drawing to a conclusion. A hydraulic test is expected in mid-May. 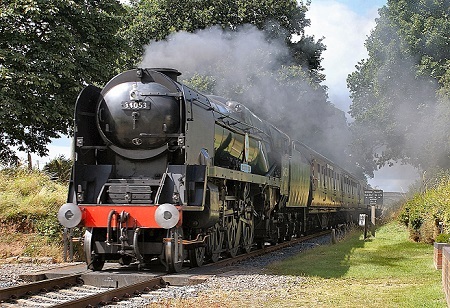 That should be followed by a steam test, and if all goes will the boiler may return to Herston towards the end of May. While most remaining tasks await the return of the boiler we are still re-making the casing and overhauling various fittings. All of 257 Squadron's cladding panels have now been made. They will have to be taken down again for painting and when the boiler is mounted. Much of the previous cladding deteriorated while 257 Squadron was stored out of service in the early 2000's. 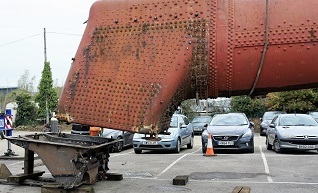 Eddystone was moved to Herston Works on 23rd March. 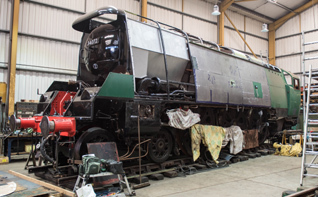 It's being stripped prior to having its boiler lifted. 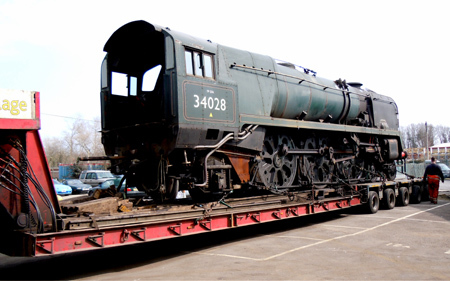 34028 Eddystone has been stored near Swanage for over a year. Key items have been removed and much grease applied it does look rather unloved. The shiny tender is the new one built for 34072 257 Squadron. The outside big ends have been protected by metal tubes with wood packing. The tube may be rusty but the bearings are in good condition. Our Standard 4MT tank has been a backbone of services on Swanage Railway for many years and remains in regular service. Major boiler repairs were made in 2014-5 however we've known that major work on the axle boxes and pistons would be needed. After discussion with Swanage Railway and possible loco workshops we expect it to go to Tyseley in May. The work will take several months to complete. 34070 Manston is in service at Swanage, and should see plenty of work over the summer in the absence of other regular locos. 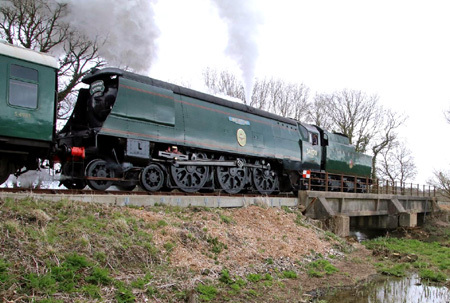 During its Spring Steam Gala Swanage Railway ran a public service north from Norden to Bridge 5, over the river Frome, close to the junction with Network Rail, for the first time. Manston is seen here on 8th April. 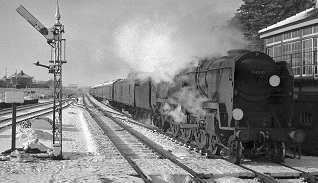 It was the first timetabled service by a Bulleid pacific on that section since 3rd September 1966. Slightly off-topic, Manston airfield is 100 years old in 2016. A celebration will be held there on Saturday 28th May, more details can be found here. Paul Atterbury is well known for his appearances in BBC's Antiques Roadshow, however many of us will be more interested in his books on the role of railways in society and culture. 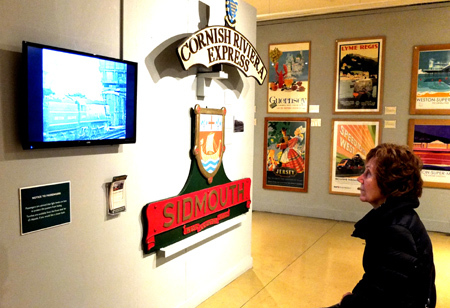 Paul lives in Dorset, and has brought together a display of railway posters in a new exhibition called "Speed to the West" which opened in the Dorset Museum on 19th March and will run till 7th January 2017. The exhibition features a remarkable collection of GWR and SR posters, interspersed with some other railwayana, not least SLL's replica 34010 Sidmouth nameplate, and our fliers appealing for support. The museum is in the centre of Dorchester and is well worth a visit. Full details can be found here. Paul and co-author Richard Furness have also recently published a book called, "Speed to the West - A Nostalgic Journey". 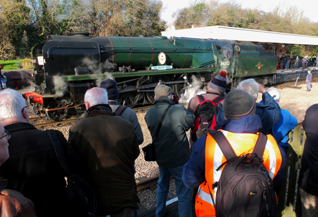 2016 promises to be a busy year for visits by our locos to other heritage lines. These are arranged between their regular operators and the proposed destination, though SLL is asked to approve each trip, which we normally agree to. Already this year 34053 has spent two weekends running at the Great Central Railway where it attracted a lot of attention. It will return briefly to SVR and is then off to the West Somerset Railway for their Spring Steam Gala. 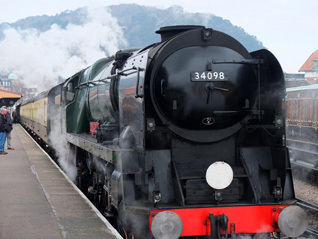 On the first weekend it will run in its normal guise, on the second it will carry the number 34098 and the name Templecombe to reflect the gala's Somerset & Dorset theme. The visitors were out in force on Saturday 30th January when the weather was cold and bright. Sir Keith Park was the centre of attention on arrival at Leicester North with the 11:15 from Loughborough. Renaming a WC/BB is not as simple as one might imagine; "originals" and "modifieds" are obviously different, some WC's had crests, others didn't, and BB's nameplates are quite different to WC's. Added to which the length of the support bracket is determined by the length of the name. All of which explains why a team from Herston spent a few happy hours removing the nameplate brackets from Eddystone and cleaned them up so that they could be fitted to Sir Keith Park along with Templecombe nameplates. 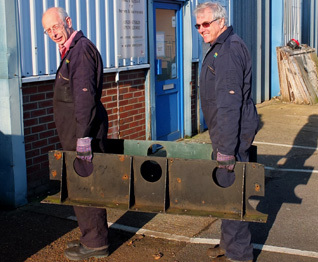 Geoff and Simon carry Eddystone's nameplate brackets into the workshop to be cleaned and painted. They will carry the Templecombe plates at the WSR Gala. Mike is preparing to line out Manston's cabside. New numbers will be needed....I wonder what they will be? 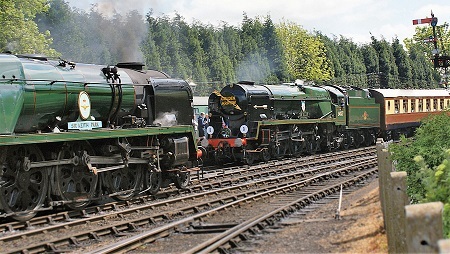 Not content with 34053, the WSR has also arranged for 34070 Manston to take part in the gala. This will be the first time 34053 and 34070 have met since 34053 left Herston works in 2012. WSR Galas are always popular, and visitors are advised to book tickets (and accommodation if required) in advance. We anticipate further trips by our locos during the year, and have set up a photo gallery to record our locos in unfamiliar surroundings. We welcome contributions from the many fine photographers who record these events. 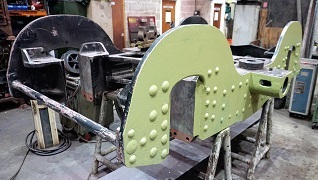 The good news is that work is progressing on the boiler in Stockton, however some weeks more work are required, and we are running out of tasks which can be done on the loco without its boiler being in place. On the brighter side this does mean that we are able to start work on some majors components for Sidmouth, e.g. 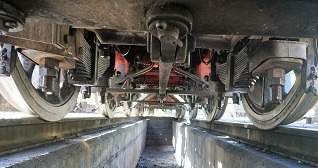 the main axle boxes which were in very poor condition, some needing new steel sides to be welded into place. 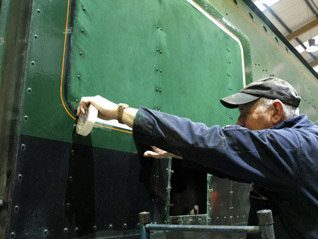 Work continues on the cladding for 34072 257 Squadron. 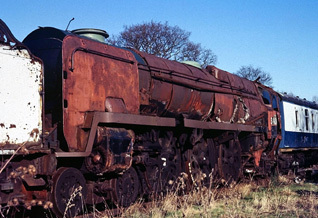 Much of 257 Squadron's cladding deteriorated while the loco was stored out of use 10-15 years ago. As mentioned above major components for Sidmouth have been taken down from the racks, inspected, and in some cases repairs have started. We're working on a schedule to determine what needs to be repaired, remade, or borrowed for the loco. The frames of SLL tender 000 have been cleaned up, and new sections of steel have been added where extreme corrosion has occured. This involved traditional "hot rivetting" of frame sections by SLL staff, a tribute to their range of skills. Part of our video has been shot 'on location' at Eldon sidings where Sidmouth's frames are stored. The frames were cleaned and painted at Sellindge about 10 years. Exposure to the wind and rain since then has taken its toll on the paint, but there's nothing that can't be put right. Meanwhile the webmaster's fame spreads ever wider, with an article which has appeared in the Western Morning News and the Western Daily Press. Their 'Nostalgia' reporter, Roger Malone, knows all about Bulleids and a trip to Herston is planned. 34070 has over-wintered in Herston for some repairs and maintenance. 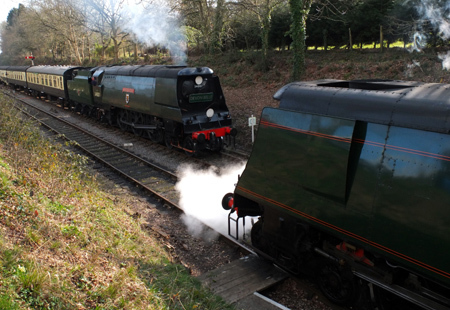 It will be going directly to the WSR Gala at the beginning of March, and then return to service on Swanage Railway. 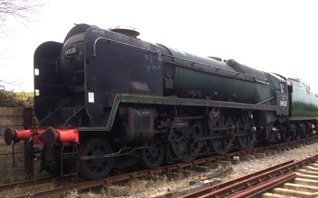 34070 Manston last visited the WSR in 2014, though it failed with a piston problem on the Saturday morning. It's seen on the previous day awaiting the arrival of 34007 Wadebridge at Crowcombe station. Hopefully this time we'll see 34070 passing 34053. Photo: Ian Emerson. Alan was born in Somerset and grew up in the north. Childhood trips to Guildford fostered his interest in things Southern, notably the Somerset & Dorset. His model of Braysdown & Writhlington has been featured in model railway magazines and was exhibited at the Warley show. Alan has published nearly a hundred video on his YouTube channel. Since the plan to restore Sidmouth was announced at our AGM on 24th October we have received applications for shares from over 50 people, many of them new to the company. A big 'thank you' to you all. The value of shares applied for exceeds £40,000. Many are from residents of Sidmouth where the project has been reported in the local paper and fliers have been circulated to hotels, libraries, etc. 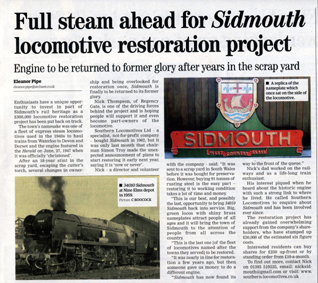 The Sidmouth Herald ran a half-page article on the restoration of 34010 on 25th November which has resulted in a number of supporters getting in touch. We've created a flier to outline the history of 34010 Sidmouth and encourage interest. This has been widely distributed in the area. Completion of 34072 257 Squadron remains our first priority, however some work on Sidmouth has started. The storage racks have been taken down and components selected for repair. Meanwhile 257 Squadron's brand new tender was moved from Herston on 24th November and the frames of SLL tender 000 which hitherto ran with Eddystone were moved into the works. These have been stripped so that parts can be inspected and repaired. The new tender tank is approaching completion, and we expect tender 000 to be completed during 2016, well ahead of Sidmouth with which it will run. 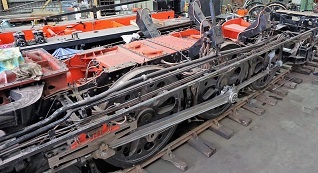 The frames may still be on a wagon at Norden, but the long task of rebuilding Sidmouth's rolling chassis has started. Six axle boxes have been taken out of storage, some needing major repairs. 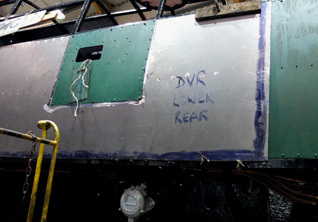 257 Squadron's tender has left the works, and the chassis of SLL 000 tender has come in. Volunteers are cleaning this in preparation for painting. Work has continued on the boiler, albeit at a slower rate that anticipated. We're now hoping to see the boiler by March 2016. 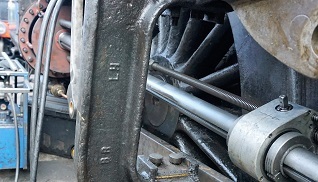 Most tasks which can be done in the absence of a boiler have now been completed; the valve gear and motion, brakes, and many of the lubrication pipe runs. The main springs are installed and much of the brake gear is in place. 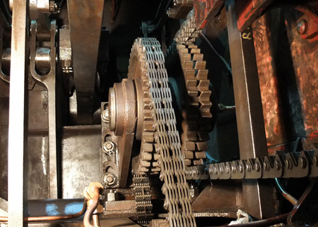 The three sets of valve gear within the oil bath are complete and the chain drive is connected. Manston has come into Herston works for a few weeks for some winter maintenance including some tidying up of the paintwork. 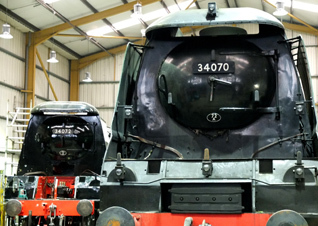 The sight of two original Bulleids in the workshop is to be relished. On the left 34072 257 Squadron, on the right 34070 Manston. Mike Frackiewicz rubs down Manston's cabside prior to repainting. In 2015 Sir Keith Park once again clocked up more than 100 operating days and ran over 8,000 miles on the Severn Valley Railway. After working some of the SVR Santas it will receive attention to the inside cylinder valves. During 2016 it's planned to make its first trips off the SVR. 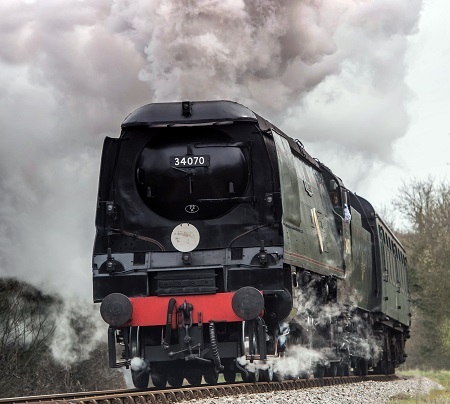 From January 29th to 31st it will be at the Great Central Railway Winter Gala and a few weeks later at the West Somerset Railway Spring Gala together with Manston. This website has registered over 200,000 visitors during the last eight years. The daily number of hits is around 65. 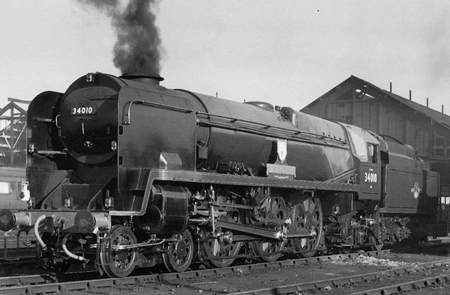 Our aim is to make the website the source of lasting information about our locos and the company. For example the section on Bulleid tenders has recently been updated. 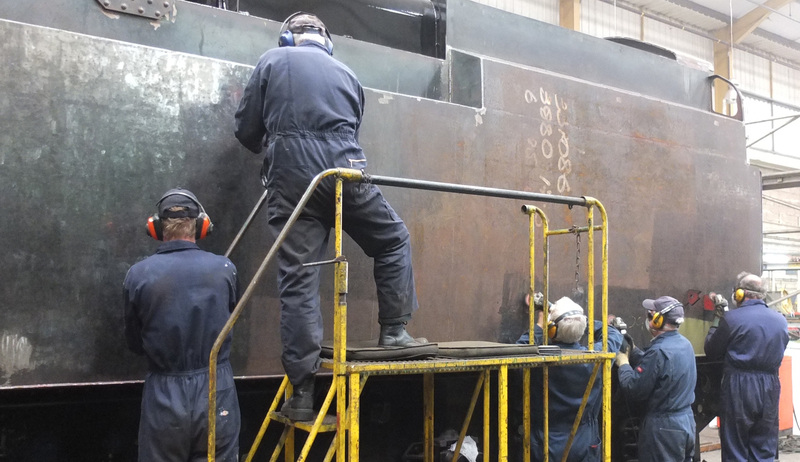 Nice new photos and 'PR' are more likely to be found on our Facebook page where, for example, a photo of five volunteers scraping crud off the frames of a tender was viewed 3000 times in the course of a few days. We also use Twitter, though frankly it's mainly there to steer twitteristas to our Facebook page and Website. Old media, i.e. printed paper, still has a role to play. 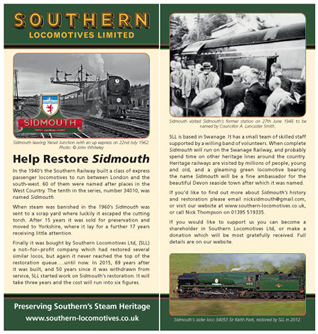 We have recently printed a 'flier' to publicise the restoration of Sidmouth. These have been used in hotels and public buildings around the town of Sidmouth. The Sidmouth Herald carried a half page article on the topic, and regular updates are planned. However printing 'facts' on paper begs fate; the SLL brochure was reprinted just last summer, and we will need a revised version in a few months as 257 Squadron leaves Herston works, and attention turns to Sidmouth. Thanks must go to Richard Green of locos-in-profile.co.uk fame for his assistance in creating these documents. Without his skills the website and the brochures would be a sorry sight! Let's not forget the SLL Photo Galleries, which survive in Picasa format despite Google's mission to make us all join Google+. Over the past year around 200 new photos have been added (mainly in the Restoration 2015 gallery, for obvious reasons) and individual photo-views approach 100,000! If you search for '34070 Manston' on YouTube you'll find over 2,000 videos of wildly differently styles and quality, a few of which originate within SLL. To aid access to our videos there's now an SLL Video Channel where these have been brought together. Also work is under way on a 10-minute video to record the history of Sidmouth, and enlist public support. This is being led by a professional producer of railway films who just happens to be an SLL supporter, and has a large stock of old cine film. No details yet, except to say that while looking through old film we came across a previously unseen clip of 34053 Sir Keith Park running in the early 1960's. Does anyone have any film of Sidmouth at work?